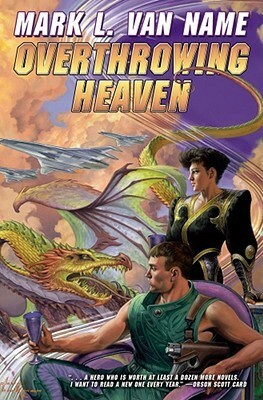 This is another excellent offering from Baen – which immediately tells those of you in the know that this is adventure space opera, with something of a military edge. There is plenty of action, with plot twists aplenty and two strong protagonists who fully engaged my sympathies and drew me into the world. Jon Moore grew up on an island of outcasts and in a prison laboratory. When he escaped, memories of the things he’d done still haunted him and he often helped those in need. This particular adventure began as a favour to a woman trying to get away from an abusive household. However, his kindnesses frequently didn’t work out well. This one really didn’t work out well. It hurled John and Lobo, the intelligent assault vehicle and Jon’s only friend, down an accelerating, dangerous spiral involving: private armies and government covert ops teams; a courtesan who always seems a step ahead of him; rival superpowers that define ethics as whatever doesn’t get in their way; and a brilliant, amoral scientist to whom human beings are just more experimental animals – and who might be Lobo’s creator. I have to say that the book is better than it sounds on the blurb – I’m not convinced that their back-of-the book summaries are one of Baen’s strengths. However, there is nothing wrong with the quality of their current stable of authors – I’ve recently read a batch of Baen books which have all impressed me and Van Name is one more to add to the list. His characterisation of Jon is extremely deftly done in first person viewpoint – we get a real sense of how damaged and closed off he is because of his horrific childhood. At times, this is played for laughs – Jon’s complete cluelessness with women and Lobo’s merciless teasing creates some welcome humour in amongst the ever-tightening tension. There are also times when Jon’s essential loneliness creates a real sense of poignancy. I also very much liked the fact that despite their formidable strengths, Lobo and Jon are not depicted as invincible. They are up against a major organisation and there is a realistic appreciation of just what a difficult business it is for an outsider to gain access to Wei, the unscrupulous scientist, whom Jon and Lobo are contracted to extract. The other aspect to this book, which is a recurring theme throughout, is that Jon is determined that no one should die unnecessarily. He constantly wants to use trank weapons and is concerned that injuries he inflicts on his opponents aren’t life threatening. In a genre where violence is a staple and bloodstained bodies are part of the landscape, I found this preoccupation both enjoyable and a refreshing change. Jon is very aware that it is only his moral compass that sets him apart from a monstrous killing machine – and doesn’t let the reader forget it, yet manages to avoid any kind of preaching. It’s a clever trick to pull off. Van Name’s pacing is faultless. It zips along at an appreciable rate so that a 541 page book didn’t seem long, yet at no time what I ever left in any doubt exactly what was happening in any of the action scenes. He also manages to effectively provide the whole unfolding plotline from a single viewpoint without sliding into omniscient viewpoint or holding up the action with a lot of description – an achievement which is a great deal harder than Van Name makes it look. He also earns a gold star from me by managing to make a third book in a series sufficiently stand alone, that I didn’t feel I was missing anything by not having read the two earlier books, One Jump Ahead and Slanted Jack. Having said that, I’m definitely going to try and get hold of them – Van Name is a great storyteller whose world is worth another visit.